This artist's conception shows the inner four planets of the Gliese 581 system and their host star. The large planet in the foreground is Gliese 581g, which is in the middle of the star's habitable zone and is only two to three times as massive as Earth. Some researchers aren't convinced Gliese 581g exists, however. Nearly two years after spotting Gliese 581g, the celebrated "first potentially habitable" alien world, the planet's discoverers continue to fight for its existence. The discovery of Gliese 581g made headlines around the world in September 2010, because the planet was said to orbit in the middle of its star's "habitable zone" — that just-right range of distances where liquid water, and perhaps life as we know it, could exist. Just a few weeks later, however, another prominent research team began casting doubt on the find, saying the alien planet didn't show up in their observations. This group, led by Michel Mayor of the Geneva Observatory in Switzerland, had found the previously known four planets in the Gliese 581 system. But in a new study that will be published Aug. 1, 581g's discoverers examine the Swiss team's since-expanded data set and take issue with their conclusions, saying that the evidence supports the planet's existence after all. "This 5th planet would have a mass of only 2-3 [times that of] Earth, and would orbit pretty much squarely in the star's habitable zone," he added. The Gliese 581 system is a near neighbor of Earth, located just 20 light-years away. On Sept. 29, 2010, Vogt and his team announced that they'd found two new planets in the system, bringing its number of known worlds to six. One of the newfound planets, 581f, sits far from the host star, completing one orbit every 400 days or so. But 581g got far more attention, because it was said to be the first rocky, roughly Earth-size alien planet ever found in the habitable zone. Vogt and his team detected the two planets using the radial velocity — or Doppler — method, which looks for tiny wobbles in a star's movement caused by the gravitational tugs of orbiting planets. They studied data from two different instruments: the HARPS spectrograph, on a telescope in Chile, and the HIRES spectrograph, on Hawaii's Keck Telescope. At an astronomy conference in October 2010, however, the Swiss team announced that they couldn't find 581g or 581f in an expanded set of HARPS data. Over the next few months, several other research groups also disputed the two planets' existence after re-analyzing available HARPS and HIRES observations using different statistical methods than those employed by Vogt and his colleagues. And in September 2011, the Swiss team completed a study that looked at even more HARPS observations — a total of 240 radial-velocity data points. Their manuscript was submitted to the journal Astronomy & Astrophysics and made available on the astronomy preprint website arxiv.org. The Swiss group's conclusions were much the same in the more recent paper as they had been before . The Swiss team made their 240 HARPS data points available, and Vogt and his colleagues decided to do their own analysis, which forms the core of their new paper. They came to quite different conclusions, with Vogt's team finding that the data support the existence of 581g as long as the system's planets are all in roughly circular orbits. Making this assumption is not a stretch, Vogt said. "I do believe that the all-circular-orbits solution is the most defensible and credible," he said. "For all the reasons I explain in detail [in the paper], it wins on account of dynamic stability, goodness-of-fit, and principle of parsimomy (Occam's Razor)." 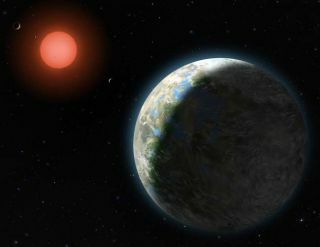 Gliese 581f doesn't show up in the new analysis performed by Vogt and his colleagues, but the scientists say that doesn't necessarily mean the planet is dead. "That does not mean it might not be there in a much larger combined data set. The present paper only is dealing with that 240-point HARPS data set, all by its lonesome," Vogt said. "We do have all of our previous data, plus new data trickling in slowly." The study also argues that 581g's existence is not incompatible with the findings of the doubting statistical papers, which the discovery team said employed an extremely conservative detection threshold. Vogt also said that his team could not reproduce the Swiss researchers' 2011 results without tossing out a handful of data points. "Our calculations of these quantities do not match those presented by the Swiss. Therefore, unless we are doing it wrong, we are obliged to conclude that they omitted points," Vogt said. "We were easily able to recover their values when we omitted 5 points." "I don't know whether this omission was intentional or a mistake," he added. "I can only say that, if it was a mistake, they've been making that same mistake more than once now, not only in this paper, but in other papers as well." The study led by Vogt is now available on arxiv.org, and it's slated to come out Aug. 1 in the journal Astronomische Nachrichten ("Astronomical Notes"), which is based in Germany. But Vogt said it was first submitted to, and accepted by, The Astrophysical Journal. The Astrophysical Journal wouldn't publish the study, Vogt said, until the Swiss team's paper was formally accepted by Astronomy & Astrophysics. When this still hadn't happened after nine months, Vogt and his colleagues decided to pull the paper and publish in the German journal. Vogt said the Swiss group's manuscript still hasn't been accepted. It will likely take more observations to sort out for sure how many planets circle the star Gliese 581, Vogt said. But the exoplanet community isn't exactly fixated on the issue. Planet hunters are finding more and more worlds beyond our solar system. The tally is nearing 800 by some counts, with thousands more awaiting confirmation by follow-up observations. And while researchers have yet to find a true alien Earth, they're getting closer and closer. This past December, for example, NASA's Kepler space telescope confirmed its first planet in the habitable zone, a "super Earth" known as Kepler-22b that's thought to be 2.4 times as wide as our planet. And Vogt is part of a team that announced another potentially habitable super Earth, known as Gliese 667Cc, in February. "The take-away message is, regardless of who eventually gets bragging rights to the discovery of the first truly confirmed habitable Earth-sized planet, we are starting to find them in unexpected numbers, and unexpectedly nearby," Vogt said. "That means there are many, many out there, at least tens of billions or more, in our own galaxy alone."